A recent study on oral microbes has found immense richness of bacteria in the saliva of Indians. Some of these bacteria were common to many samples cutting across geographical locations and ethnicities in India. This study by scientists from Centre for DNA Fingerprinting and Diagnostics (CDFD), Hyderabad, and Max Planck Institute for Evolutionary Anthropology, Germany was published in PLoS One. “Human saliva presents an easy source of studying oral microbiome because of its simple and non-invasive collection method. The microbiome co-evolves with humans and therefore, they are considered as ‘proxy markers’ to study human ancestry and migration”, says Madhusudan R. Nandineni, head of the study team and staff scientist at CDFD. “The fact that Indian population groups are genetically and environmentally quite heterogeneous is well-recognised, both factors being pivotal in shaping the human microbiome. The oral microbiome is yet largely unexplored in the pan-Indian context,” says Aneesha Acharya, a periodontist at DY Patil Dental College, Pune, and an oral microbiome expert. The research team analysed salivary samples from 92 volunteers from eight different sampling locations across India. They studied and compared the 16S rRNA region of the genome in all the bacterial samples collected from the saliva. The genome sequence coding for 16S rRNA is highly conserved between different species of bacteria, and hence is routinely used by scientists to establish relationships between different species of bacteria. Across the three regions sampled — North (Jammu & Kashmir and Uttarakhand), East (Jharkhand, West Bengal, and Assam) and the South (Andhra Pradesh, Telangana, and Tamil Nadu), the researchers found 785 Operational Taxonomic Units (OTUs) and 165 bacterial genera, indicating high level of genetic diversity, almost at par with those seen in African populations earlier. Samples from West Bengal contained the highest number of unique genera, while those from Tamil Nadu showed the least. Streptococcus spp. was seen to be the major bacterial genus in the samples, followed by genera like Prevotella, Fusobacterium, and Veillonella. With respect to the shared bacterial genera, there was a significant correlation among the states of the north. However, no correlation was seen among the samples from Assam with those from the other eastern states. Similarly, samples from Tamil Nadu did not show correlation with the rest of the southern states. One interesting observation was that the samples from north India showed only a subtle correlation with those of south India. 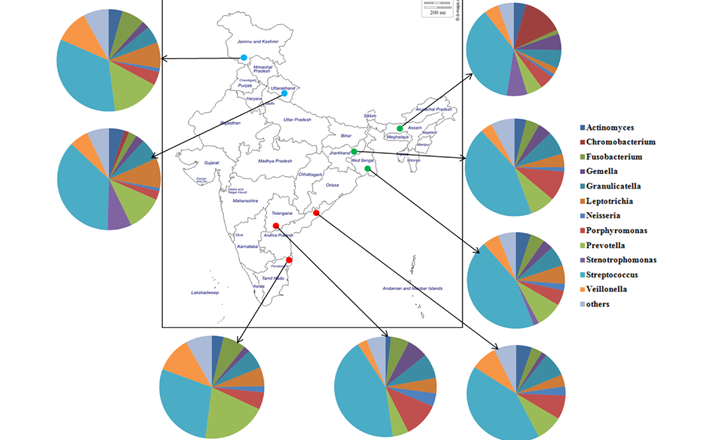 660 OTUs were found to be shared among the three regions, out of which 37 OTUs (corresponding to 12 bacterial genera) were found in all the samples, hence constituting the core microbiome for Indian populations. Nine bacterial genera, previously not listed in the Human Oral Microbiome Database (HOMD) were observed. Solobacterium spp., Lachnoanaerobaculum spp., and Alloprevotella spp. were the bacterial species found to be unique to Indian populations. The new bacterial species observed in this study highlights the importance of studying micro biomes of under-studied populations such as Indians. “When compared to the gut, the oral microbiome is not documented as well and there is much need for further work. While the present study analysed the microbiome at genus and OTU levels, algorithms dedicated to species level resolution of oral microbiota could further our understanding of microbial diversity,” says Acharya. “One of the main purposes of microbiome studies is to understand how perturbations in the microbiome composition might lead to onset of a disease in humans. Hence, it is first important to know what constitutes the healthy microbiome,” says Nandineni. Going forward, he would like to study the variation of salivary microbiome with time, lifestyle, and food habits of a population.